The Mary Baker Eddy Papers is a major effort by the Mary Baker Eddy Library to annotate and digitally publish Mary Baker Eddy’s correspondence, sermons, and other manuscript materials. A first selection of Eddy’s papers, which included sermons and related documents, was published here in January 2014. In 2015, the Library began to add all documents from the years 1872-1880. 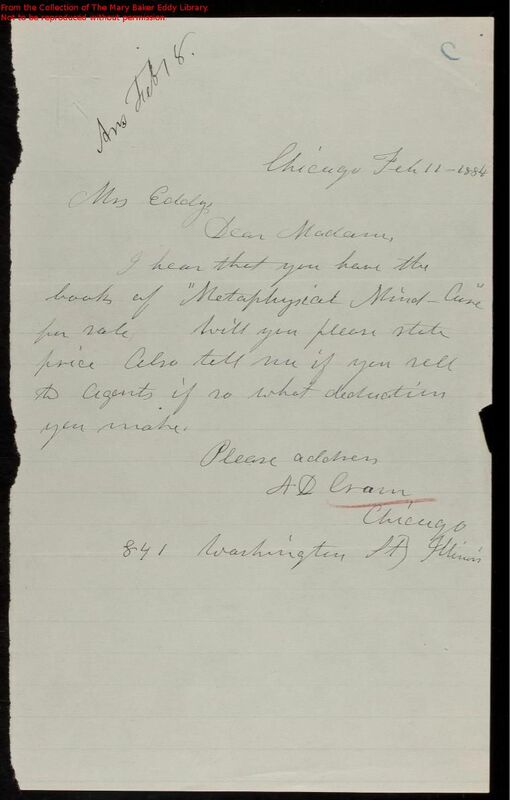 We are now publishing letters from 1881-1884. To keep up with the latest Papers news, sign up for our quarterly email update. To learn more about using the Papers site, watch this six-minute tutorial before you begin. Do you want to learn more about Mary Baker Eddy’s life and accomplishments before exploring the Papers? Visit the Mary Baker Eddy Library main site for more. Annotated transcriptions and original scans of sermons and related documents from various years throughout Eddy’s lifetime. Taxonomy reference lists to help you search by person, place, Bible reference, or reference to Eddy’s published writings. Tutorials to help you use site features, and more. Most documents past 1884. You’ll gradually be able to search for additional years as the project progresses. There are some documents past 1884 that are published here because they relate to Mary Baker Eddy’s sermons, the first documents we published on this site. General information about Mary Baker Eddy and the Mary Baker Eddy Library. The Papers site publishes more detailed information about Mary Baker Eddy and the history of Christian Science that is based on her letters and other manuscripts. For general information go to the Library main site. Click here to send comments or suggestions regarding the Mary Baker Eddy Papers site. ©2018 The Mary Baker Eddy Library. Recent additions list by accession and title. Alphabetical list by editorial title. Sequential list by accession ID. Alphabetical list by document type. Select a category on the left.